Water temperature is very important – not too hot! Keep the temperature around 190F for best results. After the initial rinse, Tea Trekker’s Zhenyuan County loose-leaf sheng Pu-erh is ready to be steeped. It does not need the ‘initial steeping’ that some Pu-erh requires. The 1st steep is very representative of what is to follow – a mild sneak preview of sorts. This 1st steeping of an Asian-style preparation should be stopped at about 30 seconds. 3rd steep – color and flavor hold, and the aroma intensifies. 4th – the aroma is the tease here – deeply earthy and woody, and the camphor element is showing most – but will diminish from this point on. I think this tea tastes much better when steeped with slightly cooled water (190F) and then I cool the steeped liquor to a warm temperature and drink it at that temp – not cold but cool. 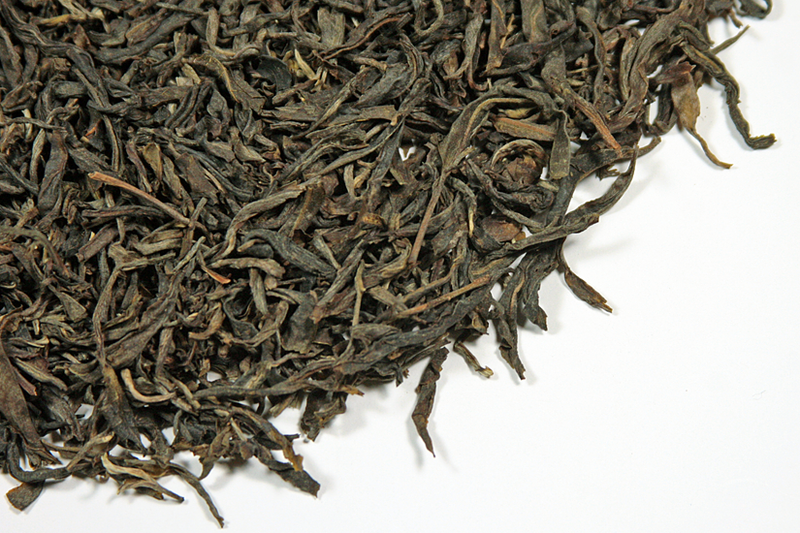 Tea Trekker’s Zhenyuan County loose-leaf sheng Pu-erh has a flavor that is woodsy, but with a clean, fresh style. The steeped leaf has an intriguing hint of the camphor wood taste. More commonly noticed as an aromatic, both in cooking and incense, this characteristic brings a complexity and drying quality to the overall flavor of this tea. Elements of this naturally clean and slightly mentholated characteristic are also released in the aroma of this tea. This loose-leaf sheng Pu-erh is made from fresh leaf material that was plucked from old-bush tea trees on the hillsides around Zhenyuan County. Politically, this region is under the administration of the Yizu-Hani-Lahu Autonomous County and the ethnic tribes living there who are responsible for nurturing and protecting both ancient tea trees and newer tea bush plantings of large-leaf tea bushes. This leaf is similar in composition to what is harvested in other parts of Simao and throughout Yunnan Province for use in pressing sheng Pu-erh tea cakes (beeng cha.) This section of the Mekong River Valley (referred to as the Lancang River in China) in Yunnan Province has micro-climates that influence the characteristics of flavor and aroma that are so desired in the finished Pu-erh. The fresh leaf undergoes a short sun-withering and a quick de-enzyming step (kill-green) in a tea firing pan. The leaf is then rolled and twisted by hand to generate internal cell changes within each tea leaf. Finally, the leaf is given a partial drying in the shade (to allow the residual moisture to begin natural fermentation) and then final drying in the sun. This tea has a light, sweet flavor, and is un-fermented. 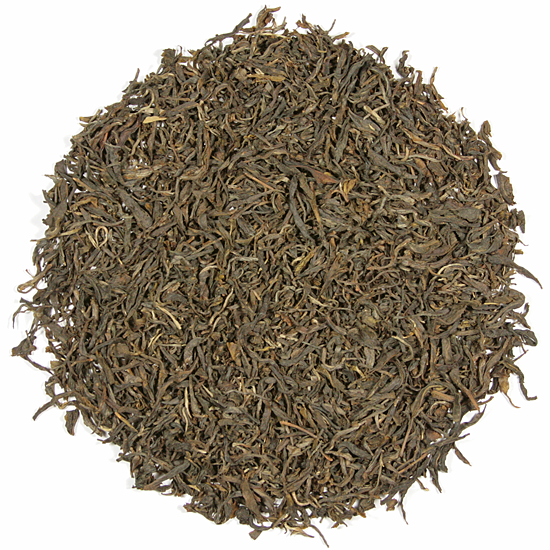 It is delicious drunk plain as an easy-going, refreshing, and light tea for easy sipping. Most commonly served at room temperature, sheng Pu-erh can be even more refreshing than iced tea when served slightly chilled. Harvested from old-growth tea bushes in 2009, this tea has been stored in superb conditions. It has gained just enough age to have given up its youthful, woodsy astringency. You can certainly drink it now, or put some aside for the future. Interested in cooking with tea? Mao cha can be used to make a flavorful stock for a hearty vegetable soup that might feature kale, cabbage, beans, mushrooms or squash! Sheng Pu-erh is also known as ‘un-cooked’ or ‘raw’ Pu-erh. It is the un-fermented version of Pu-erh.Sheng Pu-erh is un-fermented when young but microbial activity on the leaf will allow the tea to slowly ferment over time when the tea is kept under good storage conditions. Sheng Pu-erh can be drunk now or stored for years to allow a slow microbial transformation of the tea into something rich and full. Similar to young wines that will, over time, tranform into much more substantial wines, Sheng Pu-erh is prized by collectors and tea enthusiasts for this ability to age and transform over time. Tea Trekker’s Zhenyuan County loose-leaf sheng Pu-erh is very high in positive chi, so may cause flushing and a pleasant warmth emanating from the belly.